Footnotes: 22 - Includes 1/8 in. NPT sender. 23 - Air-core meter movement. 33 - Includes 1/4 in. NPT adapter/fitting. These Ultra-Lite analog gauges from AutoMeter are one of the hottest instruments in motorsports. Their aluminum construction greatly reduces their weight, while their satin anodized aluminum faces and black accents make them easy to read. These quality-engineered mechanisms offer proven durability and unbeatable style. My car does not have a real factory oil pressure gauge, I would like to install something along the lines of the Auto Meter 4327. However I don't want to loose the functionality of the factory low oil pressure warning (triggered by a switch). Does the sending unit have an output that would be appropriate for triggering a switch? If not is there another sending unit that does? Thanks for your question. When measuring fluid pressure (such as oil), first check for available auxiliary ports into the oil galleys on the engine. 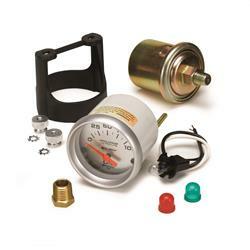 AutoMeter offers a selection of adapters for the most common port sizes that will allow installation of the sending unit included with ATM-4327. If no additional ports are available, you will want to utilize a T or Y fitting into the factory switch location that will allow fitment of the original switch as well as the new sensor from the same point. Contact a Summit sales rep for assistance locating an appropriate fitting once you have determined the thread pitches required for the installation. The sensor included with ATM-4327 utilizes 1/8" NPTF male threads. Use with part#ATM-5284 when doing an LS swap. Had to buy an elbow to install sending unit. Replaced my 16 year old gauge of the same style. Mine started to act up, but after 16 years I cant complain. Hope I get another 16 years out of this one. Fit and finish was good, sending unit worked perfect. Love the looks. Wish they would include an amber light cover. One negative - The full circle clamp ring make it a bear to install gauge if you don't have full, easy acces to back of gauge. Why not use a half- circle or a double leg clamp?